Most of the time when people ask questions at Comic-Con's TV panels, they're about making the show, or what we can expect next season. 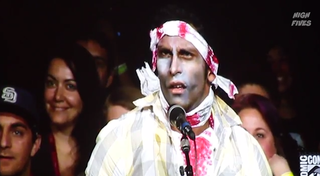 But this fellow asked what the Walking Dead cast is doing to raise awareness on behalf of people who have been bitten by zombies — here's what they said. We mentioned it yesterday, but Emergency Awesome has posted the entire Walking Dead panel (without the joke clip and trailer) to YouTube. Our favorite moment comes at 2:31 in the second video, when our bloody friend shows up. He stays in character throughout the answers and Lauren Cohan responds to him quite gamely.